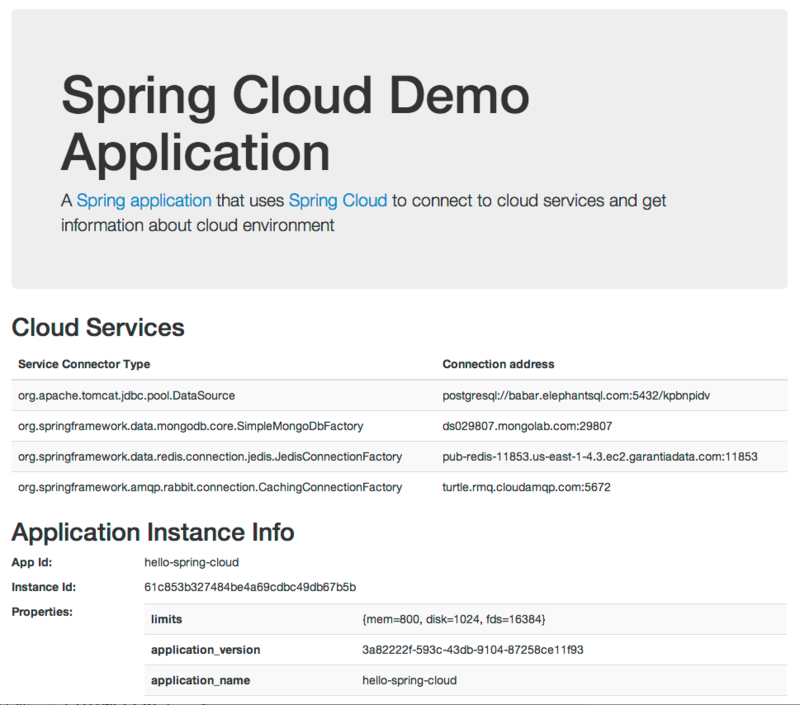 In this blog (first in a series), I will introduce Spring Cloud and show its usage from the application developer point of view. We will develop a simple application and deploy to Cloud Foundry and Heroku. In subsequent blogs, I will explore the extensibility angle. One of the many advantages of running an application in the cloud is easy availability of a variety of services. Instead of managing hardware, installation, operation, backups, etc., you simply create and bind services with a click of a button or a shell command. How do applications access these services? For example, if you have a relational database bound to your application, you will need to create a DataSource object based on that service. This is where Spring Cloud helps. It removes all the work needed to access and configure service connectors and lets you focus on using these services. It also exposes application instance information (host address, port, name, etc.). Spring Cloud does all this in a cloud-independent manner through the concept of a Cloud Connector. While it provides implementations for Cloud Foundry and Heroku, you (or the cloud provider) can extend it to other clouds by implementing an interface and taking advantage of the rest of the library. Then, simply add the library containing the extension to your application’s classpath; there is no need to fork and build Spring Cloud. Spring Cloud also recognizes that it cannot possibly cater to every service on every cloud. Therefore, while supporting many common services out of the box, it allows you (or the service provider) to extend its functionality to other services. Just as extending for other clouds, you add the jar containing your service extensions to your application’s classpath. Finally, it features a special support for Spring applications (in a separate module) including Spring Boot applications in the form of Java and XML configuration support and exposing application and services properties in an easy to consume form. This is the only module in Spring Cloud that depends on Spring. Other framework providers may contribute specific support for their frameworks in a similar manner. Let’s see Spring Cloud in action. We will start with a simple application (source code) based on Spring Boot (a traditional Spring MVC application would have worked fine, albeit at the expense of a lot more setup code). The application consists of a controller with beans injected representing bound services and a home page that prints information about the services bound to the application. HomeController has four injected dependencies representing services that could be bound to the application and another one for the ApplicationInstanceInfo. The "/” route add a string representing each service along with its class to the model as well as the instance info. The associated view renders all this information. The class extends AbstractCloudConfig, which is the way to use the Java config approach with Spring Cloud. We set @Profile(“cloud”) to ensure that this configuration is loaded only in a cloud environment. The @ServiceScan annotation scans for all bound services and create a bean for each (which then are autowired into HomeController). If you are wondering about the parallel between @ComponentScan and @ServiceScan, you are right. While the former scans for the candidate classes that could be instantiated as beans, the latter scans for bound services. We also create a bean corresponding application instance information. In a real app, you probably would inject these services into service beans and do something more useful that printing their connection information! 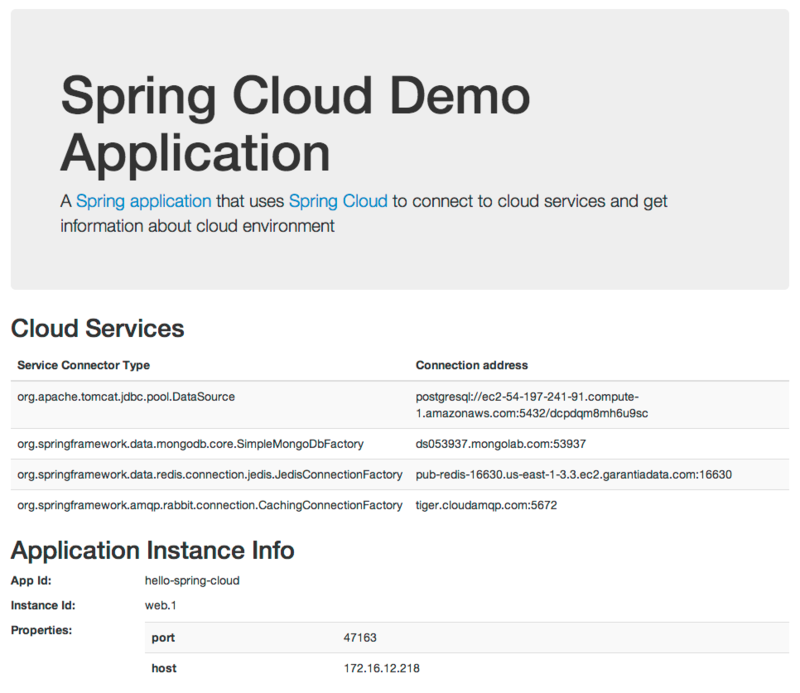 Please head over to http://projects.spring.io/spring-cloud to see a list of sample apps that do more interesting things with Spring Cloud. Speaking of http://spring.io, it too uses Spring Cloud underneath. Here we create add-ons (similar to Cloud Foundry services) for a MongoDb, Redis, and AMQP service provider. Heroku automatically provisions a Postgres service, therefore we don’t need to explicitly add it. Heroku app’s environment, unlike Cloud Foundry, doesn’t expose the app name, so we use heroku config:set to explicitly set it (if not, Spring Cloud will set it to <unknown>). There are a few other differences in how Spring Cloud adapts to differences between these two clouds; we will cover those in a later blog. That’s all we need to do. When we visit our application, it shows all services info much the same way it did on Cloud Foundry. The DataSource created this way will have max pool size of 20 and max wait time of 200 milliseconds along with a specific connection property string. Spring Cloud abstracts connecting to cloud services and makes it possible to have the same application deployed to multiple clouds with little extra effort. In this blog we merely scratched the surface of what Spring Cloud offers. In the next blog, we will explore more about the Java and XML config as well as how you can use its core API in non-spring apps. In the blogs that follow we will dive deeper into the extensibility angle of Spring Cloud.